Pay per click (PPC) advertising isn’t a new concept, but it’s becoming increasingly important in the increasingly competitive digital space. Smart digital marketers take advantage of pay per click advertising and SEO practices to maximize their visibility on search engines. If you’re interested in running pay per click ads for your business, it might seem like a daunting task to get started. 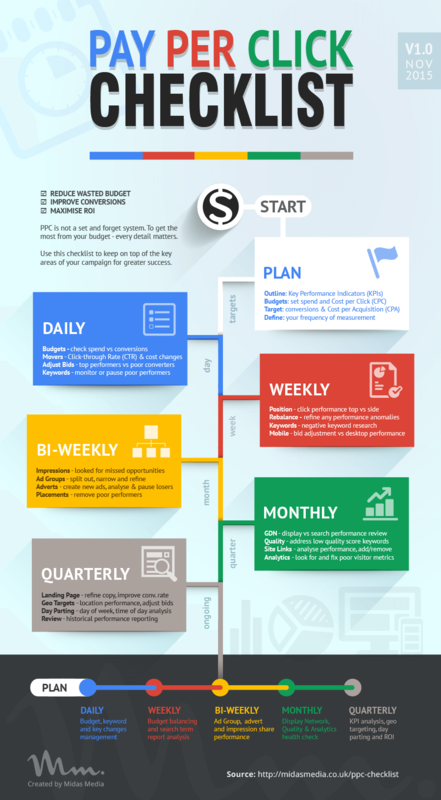 For this reason, Midas Media has put together a handy checklist to help you create the perfect PPC ad. If pay per click advertising seems like too much to do on your own, or if you want to see if you’re doing it right, our team at ImageWorks can help. We offer a complimentary Paid Search Audit to help you understand the best keywords and best tactics for paid search ads for your business that will yield you the best results. If you choose to outsource your PPC management to us, our proprietary bidding algorithm will help ensure your ads run for the most optimal keywords at the best possible price. Contact us today for help with PPC advertising for your business!